Destiny: Rise of Iron review: "A great expansion but straining within the game’s current framework"
Excellent, story-driven campaign is brilliantly crafted. The brand new Strike is of top quality. The new tools for class experimentation should add a stack of ongoing depth. The campaign ends a couple of missions too soon. Dropping last-gen hasn't resulted in any drastic visual upgrades. With the addition of Rise of Iron, Destiny now feels as complete as is imaginable. Its excellent – if slightly briefer than hoped – campaign delivers some of the best-crafted, story-driven action Bungie has made since Halo. Its new sandbox world brings a raft of new places and activities to explore, and its new competitive and co-operative multiplayer modes wring a few last drops of possibility from the game’s incredibly versatile PvP and PvE mechanics. All of this is very good, and makes Rise of Iron a fairly easy package to recommend – and that’s before we even get into the currently unrevealed Raid, built around the currently raid-less Fallen faction. Though on the flipside, it does now rather feel like Bungie might have hit a level cap of its own, maxing out what Destiny can currently do and be. Rise of Iron is a great expansion, but it feels like one slightly straining at the edges of the game’s current framework, creatively excellent, but on the verge of repeating itself systemically. 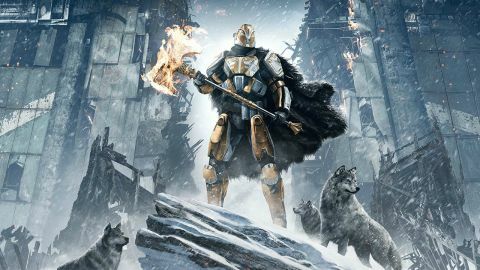 With last-gen platforms finally dropped in favour of a PS4/Xbox One-only release, Rise of Iron feels rather like a last word on the original Destiny, if you’ll excuse the accidental pun, before we move on to the inevitable sequel. That said, if that is indeed an accurate appraisal, then it will be a hell of a confident and classy expansion to go out on, one that neatly side-steps its mechanical familiarities with an increased focus on narrative craft. The difference is apparent as soon as you start Rise of Iron’s story campaign. Although only a few hours long (you’ll probably finish your first, normal difficulty run-through in an evening, though obviously that’s always just the precursor to weeks of iterative, repeat play for progressive rewards, as part of Destiny’s now huge melting pot of content), it’s easily the most precisely curated chunk of campaign Destiny has yet seen, eschewing the early game’s narrative vagaries and reliance on multi-purpose, overworld spaces in favour of pacing, storytelling and set-pieces entirely worthy of a focused, single-player FPS. And a great one at that. Its first mission in particular is a striking departure for Destiny, built of slow-burn intrigue, a well-sculpted sense of genuine threat, a jarring feeling of isolation, and very real dramatic peaks and troughs throughout. Like all of RoI’s campaign, it’s entirely worth playing solo the first time through. This is one that you’ll want to take in properly, without the anarchy of co-op and the distraction of mic chatter getting in the way. From this impeccably paced, enigmatic beginning, the campaign takes in a sort of greatest hits of Destiny level design, albeit one which often retunes the model with a greater sense of urgency and purpose than before. Missions that weave cross-country, indoor and out, the former providing tense, claustrophobic tests of skill and spatial control – in truth always some of Destiny’s finest joys, as desperation forces creativity – the latter providing some splendid, airy, free-flowing vertical combat. Intensive crescendos which combine multi-part objectives with ever-increasing assault and scale, blending free-flowing strategy and gleeful, explosive abandon in equal measure. And of course, a slightly arcane, explanation-free climactic battle that turns what you know on its head – or at least quietly shifts the goalposts – forcing an engaging bit of puzzle-solving just as you wreak havoc in deeply gratifying fashion. If The Taken King showed what Bungie could do with story and mission design by bringing character to the fore and its lore into the realm of the explicit – while letting the intrigue of its Raid design lightly pepper the rest of the game-world – then Rise of Iron is the logical continuation of that reorientation. You’ll wish for more by the slightly premature end, but that’s as much the product of quality as it is brevity. That said, Rise of Iron does a great job of encouraging sustained play. Like The Taken King, it spins and recontextualises its content post-‘completion’ through multitudinous spiralling questlines. Not with the same, months-worth volume, certainly, but within just a few hours I’d already unlocked a bonus story mission, with the promise of at least one more to come. As is always the way with Destiny, the concrete ‘amount’ of content is only an indication of how far it can be reworked and re-experienced through different lenses for different purposes, and although it’s early days, the promise of an eventual experiential scale somewhere between House of Wolves and TTK feels plausible, if gauged slightly closer to the former. Beyond quests – one of which, yes, will earn you the Iron Gjallarhorn – the new Record Book will be key to extended play as well. Picking up where the previous Moments of Triumph record left off, this addition formalises abstract progress through a great many activities, offering tangible rewards for all kinds of in-game tasks, from hard-level replays to more ambient achievements. Perhaps its biggest incentive for completion is the promise of the new, beautiful-looking, medieval-style Iron Lord armour set. It’s a neat addition, providing a new, tertiary means of further spinning out play-time – Destiny’s true metric of content has always been in reworking more than adding – and also bringing alternative means of progress, beyond simply throwing yourself repeatedly at the same elite event. That said, Rise of Iron also has three new Strikes to throw into the mix once the expansion hits the daily and weekly playlists. Two are remixes of famous (or infamous) early Strikes, bringing back Sepiks Prime and Phogoth, while the brand new one, The Wretched Eye, is a killer slice of classic Destiny. One of the most assured and complete Strike designs in quite a while, it’s a great example of the pacing, variety, co-op strategy, and compelling boss design that the game can do so well. I’ve already detailed a full playthrough from Gamescom, but if you don’t have time to read that, do know that the tricksy, shifting strategy of the final confrontation alone makes it entirely worth playing. On the PvP side, Rise of Iron brings three new Crucible maps and one new game mode, Supremacy, which mixes up the standard team deathmatch set-up by delivering extra points for snagging the Crest dropped by each downed opponent. It seems a simple twist at first, but the frantic race to double the points for every kill, coupled with the chaos of choke-points and the ability to deny a Crest grab by taking it back for your team before the opposition does, make for some delightfully hectic play when things heat up. As does the scope for more involved strategy using wingman overseers and sneaky class abilities. Sunsinging Warlocks with self-revive abilities, prepare to be hated. As for co-operative staples, the new Patrol area, the Plaguelands, brings the Archon’s Forge. Effectively a blend of the Prison of Elders and The Taken King’s Court of Oryx, this in-world arena location can be activated by offering certain special currency items at its entrance, summoning an array of large-scale wave battles – and increasing rewards – for the price. Given its scale, and the multi-leveled verticality of its setting, it’s a distinctly chaotic experience - particularly given that late-coming players can buy into the sealed arena after a battle starts - and although the full scope of its reward tiers obviously aren’t currently known, it’s a hell of a hoot to play through in its own right. That’s the other great thing that Destiny has always got right. However long you might repeat and grind for particular gear, the actual experience of playing is always a joy. The final kicker – and a wisely judged one at that – is the new Iron Lord artifacts system. By taking on certain tasks at the picturesque new Felwinter’s Peak social hub, you can earn a ‘Legacy’ item pertaining to one of the eight original Iron Lords. Cash this in, and you can equip a new, additional perk – one available every week - each of which offers fundamental game-changing abilities. Unlimited sprint, overall stat changes, double-grenades… These are the kind of major shake-ups that will fundamentally recontextualise current character builds, and therefore the entire experience of the game. And given their time-rationed nature, it seems that they’re intended to be experimented with, offering scope for long-term tweaks and rebuilds for quite some time to come. The system is a very economical piece of design, but one which should deliver a great deal of experiential content as it reshapes and multiplies the possibilities available. And that’s Rise of Iron all over, really. It might not offer the huge, nuts-and-bolts content-dump that The Taken King did, but this is an expansion built in layers rather than breadth. It delivers enough new places to see and things to do, of such a high quality – and do not forget, this is me speaking before the Raid – to give Destiny’s overall ecosystem a worthy shake-up, but the various resonant means it offers to change the experience have even greater potential. If you’re a long-standing Destiny player, it’s almost certain to refresh and revitalise your daily visits. And if you’re a curious newbie, there has (once again) never been a better time to jump in. This gameplay for this review was undertaken at a review event at Bungie's studios. Get the latest Destiny: Rise of Iron news, tips, guides and information in our Destiny Rise of Iron hub which we will be constantly updating.